Augie Hartnagel tracks his shot during a tournament this season. 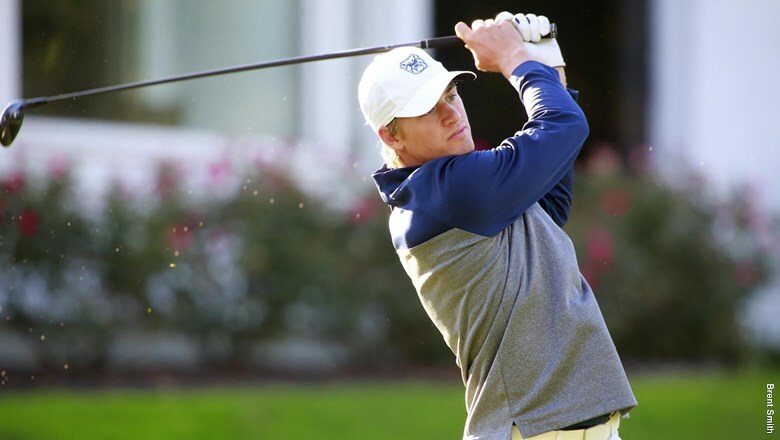 The Butler men’s and women’s golf teams both took first place at the Big Four Classic on April 9. Photo by Brent Smith/Butler Athletics. The Butler men’s and women’s golf teams took home first place on both a team and individual level in the Big Four Classic at Crooked Stick Golf Club in Carmel, Indiana, on April 9. The men’s team posted a team score of +11 to win the event by 22 strokes over Hanover College. Butler and Hanover were joined by DePauw University and Wabash College to complete the four-team field. Junior Pat Allgeier led the men’s team and the rest of the field, carding a 3-under 69, winning the one-day event by six strokes. Allgeier led the field in birdies with six and birdied all four par 5’s at Crooked Stick. The Bulldogs occupied three of the top five individual finishes as Logan Sabins and Michael Cascino fired rounds of 75 and 77. Five Bulldog golfers finished in the top 10 individually and Butler led the field with 15 birdies as a squad. The women’s team saw similar success during the 18-hole tournament as they shot +21 as a team,beating Hanover College by 56 strokes to take home the victory. The three-team field also included Franklin College. Butler’s seven players took seven of the top eight spots on the leaderboard, led by senior Lauren Tibbets, who won the event with a 1-over 73. Ally Ross finished second with a 4-over 76 and Megan Skoog and Claire Edwards finished in a tie for third after both carding an 8-over round of 80. The victories marked the first time since the 2015-2016 season that both teams won the Big Four Classic. The two teams have one tournament left each before Big East Championship. The women’s team will head to Purdue to compete in the Lady Boilermaker Invitational on April 13. The men’s team heads to Springboro, Ohio, to participate in the Wright State Invitational on April 14.